I am so appreciative for all you have done for me. Hats off to Fred and his great team! – Jerome C.
Mr. Freibott and Staff: The best blessings in life are people like you. Thank you! – B.D. and T.P. I appreciate all that you do for me. I had no idea what to expect when I called your office and it has been such a wonderful experience. – Najamah N.
I am so happy with your office and refer everyone to you! I am so pleased with your office! – Brandon Z. To say that I am grateful for everything you have done for me is an understatement. Thank you for helping me get to where I was able to have my surgery, which appears to be a success! I am no longer experiencing the constant pain in my leg. Both my family and I are much happier! – Archie F.
I am so grateful for all you have done for me. I do not have a lot and the money the put you put in my pocket is a real big deal to me and I am blessed to have come to you. – Ursula M.
Whenever I had a question or was worried about my case, your office was always there to assist me and help me. I am very happy with everything you did for me and I think your office is the best! – Deborah R.
Before I retained your office, I googled your firm and was impressed with the positive comments. Now that I have retained you, I agree with those comments! Your firm has a great reputation out there! – Gordon H.
I deeply appreciate all that you have done for me and I would recommend anyone to your office. I love that I can lean on your office when I am not sure what to do or when I have any questions. – Paul V.
Thank you so much for providing me with good news. I am very happy right now. Sometimes this case is very hard to deal with. I’m glad that you are my friends. Have a great day and enjoy your weekend and holiday. Archie F.
Thank you so much. I’m still in a lot of pain but you all have helped so much. I love working with your law firm. – Lakera J.
I want to thank you again for all you did for me between August 4, the date of my auto accident, and now. I really appreciate your work and friendship during that time; you made things easy for me! I was not completely together, and your patience was very kind. I had complete confidence in your attention to detail and the care that you showed me, and I appreciate it so much. – Allison R.
I would recommend the Freibott Law Firm to everyone! They have taken such good care of me. It’s so hard to find someone to trust! I have such high praise for everyone there! – Letitia S.
You and the Freibott team are awesome! I have told many of friends about your firm. I am blessed to have the Freibott Firm at such a difficult time and I do not take it for granted! Many, many thanks to all of you and the wonderful job that you do. Each and every one of you are appreciated by me!!! – C.H. I am so grateful for your help. Everyone at your firm is awesome! My coworkers who have current or past claims have had other attorneys that they cannot get a hold of for weeks and they are always so frustrated! I was never frustrated as you always returned my calls quickly! – James Z. Thank you for your service and for being the best law firm around!!! – Cleo H.
You are all wonderful and I very much appreciate everything you do for me! – Nadine L.
Have you been a victim in a car, truck or motorcycle accident in the State of Delaware? You may not know it, but you have legal rights under the State of Delaware laws. Have you been hurt or injured in a casino, mall, retail store, hotel, restaurant, gym or any other public place in Delaware? Are you working in Delaware and suffered an injury while you were working? Did you have a preexisting condition that worsened after an accident? If your answer is yes to any of the above, then you may be entitled to compensation for medical bills, lost wages, repair to property damage due to the accident and or physical and emotional pain and suffering, under the Delaware personal injury law. Our personal injury attorneys are experienced in Delaware law and can help determine the financial value of your claim and make all responsible parties accountable. At The Freibott Law Firm, P.A., our Wilmington Delaware personal injury lawyers provide skilled legal representation to injured people and their families throughout all of Delaware including; Newark, Middletown, Dover, Milford, Harrington, Georgetown and the Delaware beaches. With over 50 years of combined legal experience, our Delaware personal injury attorneys have a proven track record of handling auto accident cases, workers’ compensation cases and wrongful death claims. We have an experienced legal team with litigation experience and a history of getting our clients results. 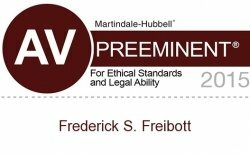 Contact The Freibott Law Firm, P.A. today, for a FREE consultation to determine how we can get you the compensation you deserve. If you were involved in a slip and fall accident, a medical malpractice lawyer, although considered a personal injury lawyer, may not be the best person for the case. The term “personal injury” is an umbrella term for various types of accident cases that can occur in many different places. Each type of personal injury case has particular Delaware laws that govern time limits for filing claims, the type of compensation you can receive, and certain additional benefits you may be awarded. Make sure when you select a personal injury attorney to represent you in your case that they have experience in handling your type of case. Today, many legal battles are settled outside of the courtroom. In certain cases, this can be best for both parties. If your case makes it to the litigation phase and ultimately to trial and if the attorney you are working with has little or no experience in the courtroom, you may not be awarded everything to which you are entitled. The Freibott Law Firm, has experienced litigators on staff that can handle your case and get you everything you are entitled to whether you chose to settle or to go to trial. Mr. Freibott and Staff: The best blessings in life are people like you. Thank you! – B.D. and T.P..
Fred-I am really happy with you and your firm. You are one in a million! – Freddie R.
Thank you for fighting so hard for me. You are awesome. Thank you for being so caring also. – Jamie H.
Thank you so much for all of your help through this process. You’ve been amazing and I appreciate it! – Bridget S.
Suffering a serious personal injury can be a difficult expertise for injury sufferers and their families. Based on the extent and seriousness of a person’s damages, he or she may need to seek costly medical treatment so that you can recover from his or her accidental injuries or at least stabilize the actual individual’s health. It can possibly be necessary to miss considerable amounts of job while recovering from often the injury, leading to any loss of wages that will put the person within a stressful financial situation. Delaware workers who are hurt on the job have a legal right to pursue workers' compensation benefits. All these benefits cover the price of medical care and dropped wages. Workers’ compensation is a form of insurance policies providing wage replacing and medical benefits for you to employees injured for the duration of employment in exchange for mandatory relinquishment on the employee’s right to prosecute his or her employer for your tort of neglect. While various plans differ, provision is usually made for weekly installments in place of wages, settlement for past as well as future economic decline, reimbursement or repayment of medical and similar to expenses, and positive aspects payable to the household of workers murdered during employment. The theory for workers’ payment insurance is that the reduction suffered by a workforce due to an manufacturing injury should be paid for directly by the market in which the employee seemed to be hired and indirectly by the general public. As a result, workers’ compensation is actually a “no fault” method and an harmed employee need not set up that his workplace was negligent so that you can receive a compensation prize. Crashes happen, of course , and some injuries are simply necessary. However , in many cases, typically the negligence or recklessness of others will cause an otherwise preventable injury to occur. In these circumstances, injury victims might have a right to follow compensation from the person or party the culprit. If you have suffered a physical injury caused by someone else, the legal team on the Freibott Law Firm can assist you seek justice as well as secure the full monetary compensation you deserve. You may assume inaccurately that there is nothing you can apply to improve your situation or maybe better your says post-accident. That is not true. Consult with a Delaware auto accident law firm immediately. It is a smart idea to request an initial consultation with one or more Wilmington DE car accident law firms as soon after your personal wreck as possible. It is best to do this only after appropriate medical treatment is usually obtained and done. Our lawyers can help you understand your legal rights and options, as well as how to best protect your own legal interests post-accident. You may assume incorrectly that there is nothing you can do to improve your situation or perhaps better your states post-accident. That is not really true. Consult with the Delaware auto accident legal professional immediately. It is a smart idea to request an initial examination with one or more Wilmington DE car accident attorneys as soon after your personal wreck as possible. It is best to do this only right after appropriate medical treatment will be obtained and completed. Our lawyers will help you understand your rights and options, as well as how to best protect your legal interests post-accident. Injuries happen, of course , and a few injuries are simply bound to happen. However , in many cases, typically the negligence or rashness, irresponsibility of others will cause an otherwise preventable problems for occur. In these circumstances, injury victims could possibly have a right to follow compensation from the man or woman or party responsible. If you have suffered a personal injury caused by someone else, typically the legal team in the Freibott Law Firm may help you seek justice and secure the full economical compensation you ought to have. Suffering a serious damage can be a difficult encounter for injury victims and their families. According to the extent and severity of a person’s damage, he or she may need to search for costly medical treatment in order to recover from his or her incidents or at least stabilize the actual individual’s health. It can also be necessary to pass up considerable amounts of function while recovering from the actual injury, leading to some sort of loss of wages that may put the person inside a stressful financial situation. Delaware workers who are damaged on the job have a right to pursue workers' compensation benefits. These kinds of benefits cover the price of medical care and misplaced wages. Workers’ pay out is a form of insurance plan providing wage replacing and medical benefits to be able to employees injured in the course of employment in exchange with regard to mandatory relinquishment on the employee’s right to file suit his or her employer to the tort of neglectfulness. While various options differ, provision can be made for weekly obligations in place of wages, payment for past and also future economic burning, reimbursement or settlement of medical and like expenses, and positive aspects payable to the household of workers murdered during employment. The theory for workers’ pay out insurance is that the damage suffered by a staff due to an business injury should be maximum directly by the sector in which the employee has been hired and indirectly by the general public. Therefore, workers’ compensation is a “no fault” system and an hurt employee need not determine that his employer was negligent to be able to receive a compensation merit.